The Canon EOS Rebel T6 / EOS 1300D is a solid if uninspiring entry-level DSLR, eschewing eye-catching features in favour of solid image quality at a low cost. It's a good option for beginners, but there are better spec'd entry-level DSLRs available if you're willing to pay a little more. Despite their low price point 'entry-level' cameras are incredibly important for manufacturers. These are the cameras with which the consumer starts their journey with a brand – and many of those consumers will stay with that brand for a very long time. Because of this, you can get a lot of camera for relatively little money these days. The Canon EOS Rebel T6 / EOS 1300D is Canon's latest entry-level proposition, and it's available at a great price for beginners, students or anyone new to DSLR photography. In fact, it's cheaper than a lot of average compact cameras. The Rebel T6 doesn't represent a major upgrade from its predecessor however, the EOS Rebel T5 / EOS 1200D – which itself was hardly a huge overhaul of the EOS Rebel T4 / EOS 1100D. It seems Canon has once again played it relatively safe with the spec sheet, which helps to keep the camera affordable for those all-important entry-level customers. The sensor is the same as the EOS Rebel T5 / EOS 1200D's at 18 million pixels, while the processor gets a modest upgrade to the DIGIC 4+ (the Rebel T5's had a standard DIGIC 4). However, considering that Canon's latest processor is the DIGIC 7, the 4+ is now looking like pretty old technology. The EOS Rebel T6 / EOS 1300D uses the EF-S lens mount, which is compatible with all of Canon's EF range of lenses, so there's a wealth of choice out there to suit all budgets. Several of the other features of the Canon EOS Rebel T6 / EOS 1300D are the same as in the Rebel T5. It has the same modest 9-point autofocusing system, with one central cross-type (more sensitive) point. There's also a 95% coverage optical viewfinder - while it doesn't sound like you're missing much, you can find unwanted elements creeping into the edge of the shot when reviewing images. Native sensitivity remains at ISO100-6,400, expandable up to 12,800, but given the slightly better processor a modest improvement in low-light performance is promised. That said, the ISO range now looks quite limited compared to much newer rivals. One feature that has seen an upgrade is the screen. The EOS Rebel T6 / EOS 1300D's LCD display is a 3-inch, 920k-dot unit, whereas the T5 boasted only 460k dots. This upgrade should make viewing images, and using the menus, a more pleasant experience. The headline new feature for the EOS Rebel T6 / EOS 1300D though is the inclusion of inbuilt Wi-Fi and NFC connectivity. This enables you to control the camera from a connected device, such as a smartphone or tablet, and you can send images from the camera to your devices to share quickly online. As well as the fully automatic and scene shooting modes you'd expect in a camera aimed at novice photographers, there are also manual and semi-auto aperture priority and shutter priority modes, plus the ability to shoot in raw format. As with the T5, the Rebel T6 offers Full HD (1920 x 1080) video recording, and you can take manual control of video, with 30, 25 and 24fps frame rates available; not surprisingly for a camera at the price point, there's no 4K shooting. Battery life remains at a respectable 500 shots, which should see you through a typical day's shooting without the need for a recharge. An obvious competitor to the EOS Rebel T6 / EOS 1300D is Nikon's 24MP D3300. That camera offers higher resolution and better battery life (700 shots) and its maximum burst rate of 5fps beats the T6's 3fps. However, the Nikon is that bit more expensive and doesn't have built-in Wi-Fi or NFC, so which camera you prefer will depend on which specs are most important to you. Considering that the T5 wasn't exactly revolutionary, we'd been hoping for perhaps a little more from Canon specs-wise with the Rebel T6. 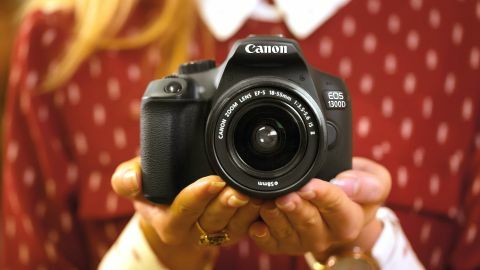 As it is, the camera keeps many of its predecessor's tried and tested features, but offers nothing particularly new or exciting – although this does mean Canon can offer the EOS Rebel T6 / EOS 1300D at a price that should be attractive to the prospective purchasers it wants to hook.